On Aug. 20, 2018, SpaceX installed an astronaut walkway at Pad 39A at NASA's Kennedy Space Center in Florida. The walkway will allow astronauts to get from the launch tower to SpaceX's Crew Dragon spaceship. 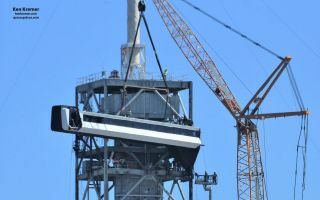 On Monday (Aug. 20), the private spaceflight company installed an astronaut walkway at Launch Pad 39A at NASA's Kennedy Space Center (KSC) in Florida, the jumping-off point for SpaceX's new Crew Dragon spaceship. Because the Falcon 9 is so tall, the walkway is pretty high up on the tower. Indeed, it's several stories higher than the one that allowed access to NASA's now-retired space shuttle orbiters, which once launched from Pad 39A (as did Saturn V moon rockets), according to Spaceflight Now. The shuttle walkway was installed about 195 feet (59 m) above the ground. Another look at the astronaut-walkway installation at Pad 39A, which required a crane. Both Crew Dragon and Starliner are reusable capsules capable of carrying seven passengers. But the vehicles will carry a maximum of four astronauts during the contracted ISS flights, NASA officials have said. Earlier this month, NASA announced the astronauts who will break in the two private U.S. spaceships. Bob Behnken and Doug Hurley will fly SpaceX's crewed demonstration mission, and Mike Hopkins and Victor Glover will take the first operational ISS flight, whenever that occurs. Eric Boe, Nicole Aunapu Mann and Chris Ferguson were chosen for Starliner's first crewed test mission, and Sunita Williams and Josh Cassada will be aboard the Boeing craft's first operational flight.